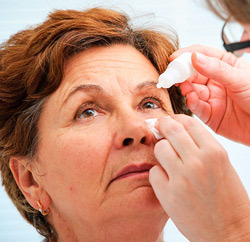 Cataracts, a leading cause of blindness in humans, may one day be treatable with eye drops instead of surgery. The University of California-San Diego (UCSD) has shown, that a solution containing a natural steroid can be given via eye drops to decrease cataracts in dogs. The lenses in our eyes are made mostly of crystallin proteins that have two jobs to do - they allow us to change focus and they keep the lens clear. But as we get older, these crystallin proteins start to come unglued and lose their ability to function. Then they clump together and form a sheathlike obstruction in the lens, causing the signature “steamy glass” vision that accompanies cataracts. The lens is also rich in a molecule called lanosterol that is an essential building block of many important steroids in the body. Lanosterol is synthesized by an enzyme called lanosterol synthase. Our study identifies lanosterol as a key molecule in the prevention of lens protein aggregation and points to a novel strategy for cataract prevention and treatment." Scientists have been hunting for years for mutations in crystallin proteins that might offer new insights and pave the way to an alternate therapy. Now, it looks like a team led by University of California (UC), San Diego, molecular biologist Ling Zhao may have done just that. Her team came up with the eye drop idea after finding that children with a genetically inherited form of cataracts shared a mutation that stopped the production of lanosterol, an important steroid in the body. The team tested a lanosterol-laden solution in three separate experiments. First, they used human lens cells to test how effectively lanosterol shrank lab models of cataracts. They saw a significant decrease. Then, they progressed to rabbits suffering from cataracts. At the end of the 6-day experiment, 11 of 13 rabbits had gone from having severe or significant cataracts to mild cataracts or no cataracts at all. Finally, the team moved on to dogs, using a group of seven, including black Labs, Queensland Heelers, and Miniature Pinschers with naturally occurring cataracts. The dogs responded just as the researchers hoped to the lanosterol solution, which was given in the form of both eye injections and eye drops. The dogs’ lenses showed the same type of dissolving pattern as the human and rabbit lens cells. The improvement was remarkable—researchers could tell just by looking at the dogs’ eyes that the cataracts had decreased. But the exact mechanism of how lanosterol manages to disperse the mass of proteins remains unknown. Let's hope we'll see it soon, among humans, one fine day. Diabetes mellitus and high body mass index are identified as additional risk factors.